The United Nations has declared that 2019 is the International Year of Indigenous Languages. Over the years, Canadian Teacher Magazine has reviewed and shared many wonderful Indigenous resources to use in the classroom (find them here: https://canadianteachermagazine.com/category/first-nations-metis-inuit/). Following are some new authentic Indigenous resources for use in the elementary classroom that promote Indigenous language learning and support language revitalization and traditional storytelling methods. Orca recently released a variety of Indigenous dual-language books, including My Heart Fills With Happiness / Ni Sâkaskineh Mîyawâten Niteh Ohcih, that complement their other Indigenous resources. Find them by viewing their Indigenous resources here: https://www.orcabook.com/Indigenous-C1606.aspx. Synopsis: The sun on your face. The smell of warm bannock baking in the oven. Holding the hand of someone you love. What fills your heart with happiness? This beautiful book, with illustrations from celebrated artist Julie Flett, serves as a reminder for little ones and adults alike to reflect on and cherish the moments in life that bring us joy. 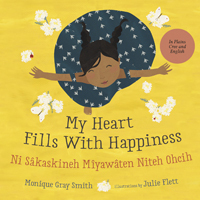 International speaker and award-winning author Monique Gray Smith wrote My Heart Fills with Happiness to support the wellness of Indigenous children and families, and to encourage young children to reflect on what makes them happy. 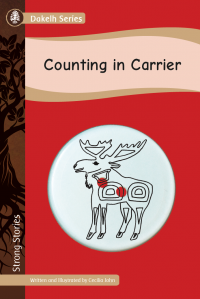 Synopsis: Counting to ten in Carrier is like counting to ten in English. But when you count people in Carrier it is not the same at all. Can you count in any other language? 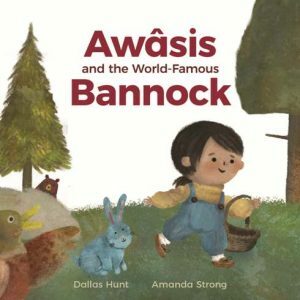 Synopsis: During an unfortunate mishap, young Awâsis loses Kôhkum’s freshly baked world-famous bannock. Not knowing what to do, Awâsis seeks out a variety of other-than-human relatives willing to help. What adventures are in store for Awâsis? The book includes a pronunciation guide and the recipe for Kôhkum’s world-famous bannock. 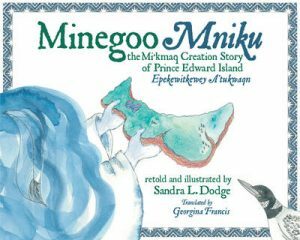 This dual-language story is delivered in English and Mi’kmaq and is recommended for ages 8 and under. Synopsis: A long time ago, the Great Spirit created all of the sky and stars but it wasn’t enough. He then made a beautiful place called Minegoo, a place so beautiful that He almost placed it amongst the stars. He decided that instead, he would place Minegoo in the most beautiful spot on earth. He summoned Kluskap and asked him to find this spot. After searching the whole world, Kluskap found the Shining Waters, the spot in the Gulf of St. Lawrence that would be home of the Mi’kmaq people created in his own image.